MuMETAL ® magnetic shielding alloy (mu metal grade ASTM A753 Alloy 4) is our most widely known brand. Mu-Metal is a unoriented nickel-iron soft ferromagnetic alloy with very high permeability suitable for sensitive electronic equipment shielding. It is used primarily in low intensity magnetizing fields (DC-100kHz) where high attenuation is desired (high permeability & high shielding efficiency). Mu-metal ® offers exceptionally high initial and maximum permeability with minimum hysteresis loss. It also has very low coercive force (Hc), very low core losses and a low remanence (Br). Available as stress annealed (partially annealed for ease of fabrication), or final annealed for maximum permeability. Mu METAL® is used for fabricated shields such as enclosures, cylinders, cans, channels or 3D boxes. Final annealing (Perfection Annealing) in a hydrogen atmosphere is required as a last processing step after all forming operations (i.e. stamping, machining, bending, rolling or welding). The final annealing treatment is paramount to the magnetic properties of Mumetal. The permeability of the cold rolled state increases by more than three orders of magnitude after final annealing. MuMETAL® alloy is available in many forms, but most shields are fabricated from our sheet or coil stock in gauges from 0.014" to 0.080" thickness [0.36mm to 2mm]. MuMETAL foil stock is fully annealed and available in gauges from 0.002" to 0.012" thickness [0.05mm to 0.3mm]. Thicker forms of MuMetal are available for CNC machining and hot forgings like round bar .25" to 8" diameter [6.35mm to 203mm] and MuMetal plates up to .197" thick [5mm]. 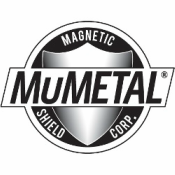 MuMETAL® is a registered trademark of Magnetic Shield Corporation.